Transcript from late-night Atlanta-area TV commercial circa 1990: "Hey, Braves fans, John Smoltz here. You may not know this, but when I was growing up, I suffered from hyperhidrosis — that's right, I had sweaty palms. (Cut to shot of some dripping hands.) And I know I'm not the only one. That's why I'm here today, to share my cure with you! It's the John Smoltz Rosin Bag! 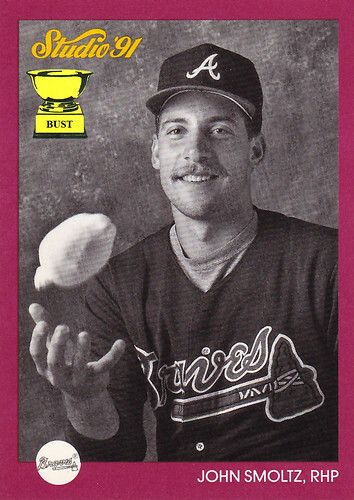 (Smoltz tosses a rosin bag with a picture of his face on it.) Look, I felt the shame every time I shook someone's hand, and I felt the humiliation every time I tried to ask a girl out. But no more! Thanks to the Rosin Bag, I'm as dry as a summer's day! Call now and I'll send you two John Smoltz Rosin Bags for the low, low price of $19.99. Trust me, you, too, can strike out swamp palm! (Cut to shot of dry, cracking hands.) For just $5 more, I'll throw in a third Rosin Bag. Put one in your garden and kiss those slugs goodbye! Put one in the fridge and toss that old baking soda! The Rosin Bag works anywhere! But whatever you do, Drippy Digits, make sure you keep one on hand at all times. (Smoltz winks) Get it? Call now!"